I owe you an update - here's a few new items from the backlog, with many more to come. Stay turned for more later this summer! Sara! 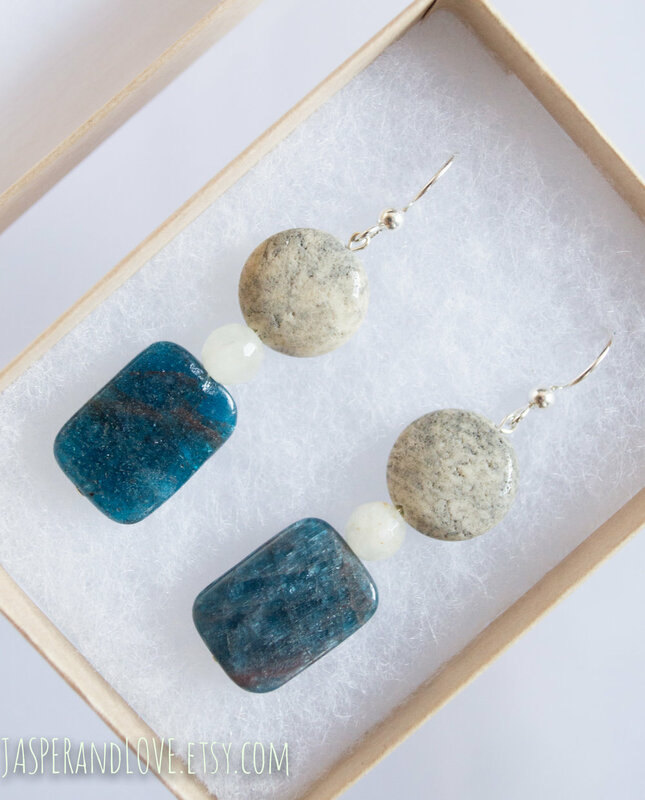 The soft neutrality of these remind me of the book title Sarah Plain and Tall, which probably inspired the naming of these earrings. Subtle, yet not lacking in detail. Notice the striations as if illustrated with graphite. 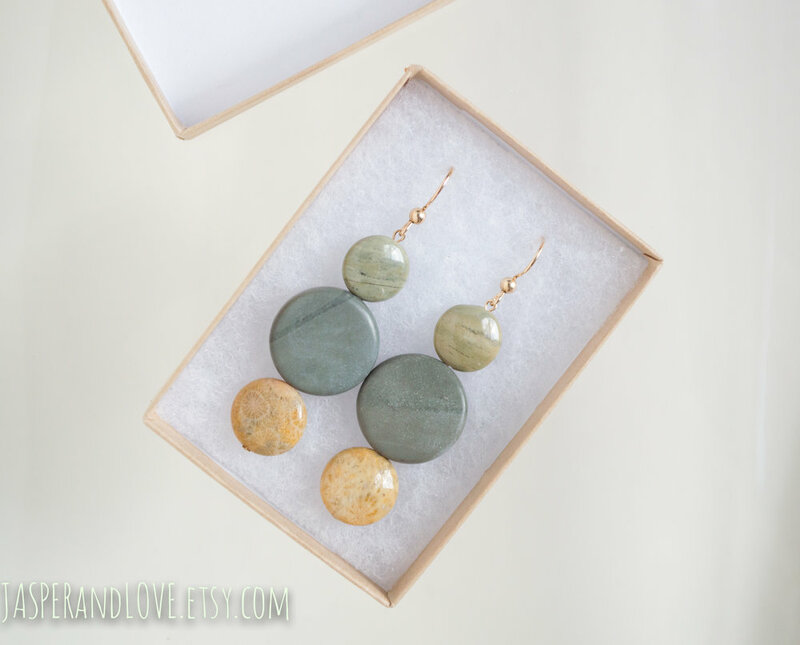 Notice the way the moonstones - tiny orange and larger grey - bring out the best in these larger jasper stones. I could go on and on about the elegance of shapes here, but I'll save that for another post about composition. Love these. You can see influences from the mood board here - squash blossoms, vines and leaves, and squash skin patterns in the far background. Do you also see the squash silhouettes? In a few weeks it will be easier to take it all in, once the color gouache is done. One of my goals for this year is to become comfortable with both Photoshop and Illustrator, so I hope to have many more posts like this - with much improved technique - as the months roll by. I was struck by the LOVELY rust on the subway platform today, and snapped a pic about five seconds before my phone died. (Poor thing.) So I've spent some time playing with the palette and composition in Photoshop. I think this is strong, but hard to digest in areas. Does your eye rest? Does it have a clear journey, or just bounce around? This is a good start, but it's not making a clear statement. Ahhhh... Am I right? This is digestible, but not boring. The overlays give structure, without eliminating the textures we had before, which allows it to keep the depth. I would use this palette for housewares (soup bowls!) or as a pillow case design. Sun fire! This is my first of many explorations with carnelian gemstones - in this case, topped with aventurine. I adore the coloring on these stones (every one is different), so the only thing I'd change is switching to a marquise cut instead of oval. 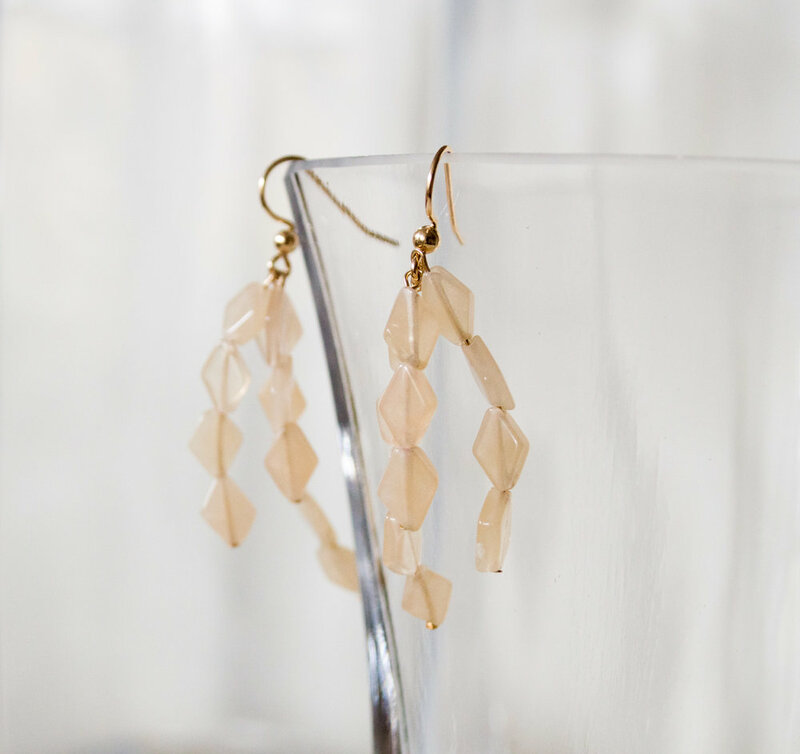 Or, if we're dreaming aloud here, an asymmetrical faceted cut, chunky but not so much that it becomes heavy. Snails! Yep, those patterns you see are snail fossils from Wyoming. (Read more, it's really fascinating: http://geology.com/gemstones/turritella/) So how did I find a tiny bead to match as a topper - is that agate too? Nope. It's glass, actually, from a mixed set that I use WAY more than you would expect (Elyn, Eva, Beach Vacation, Sadie, Abode, Moxie, they're just surprisingly versatile beads. 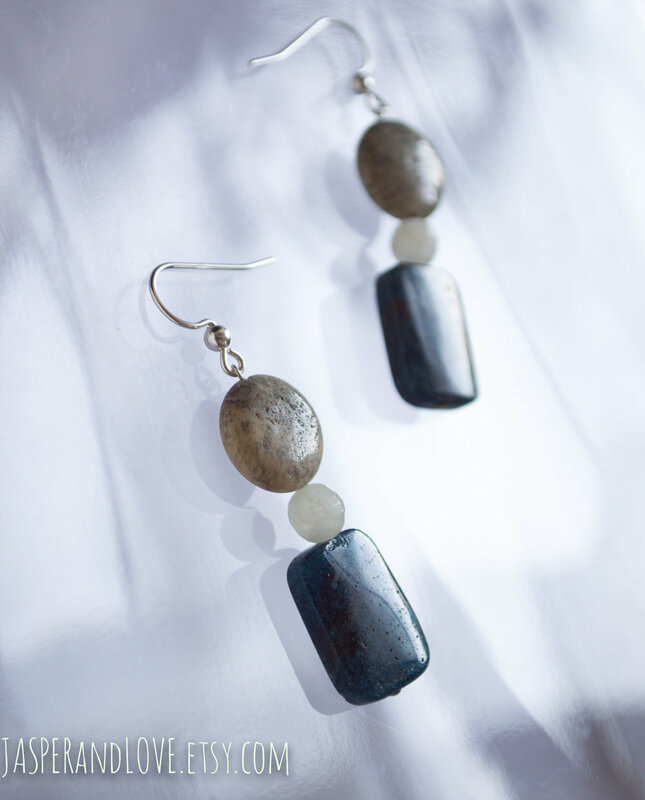 Check it out: jasperandlove.etsy.com) This particular pair is blue shot through with tanny golds and cooler indigo. Since my first round of glass pendant earrings went over so well - Siara - I had to go see what other options were available. And I'm thrilled with these. The color, the simplicity, and that first photograph that is so perfectly abstracted. Look for more riffs on this theme soon. These make me feel like New Year's Eve! Enough about me - what about you? What do you want to see? Well, hello then. It's been awhile. I feel like an elf, busy working away in preparation for the holidays! 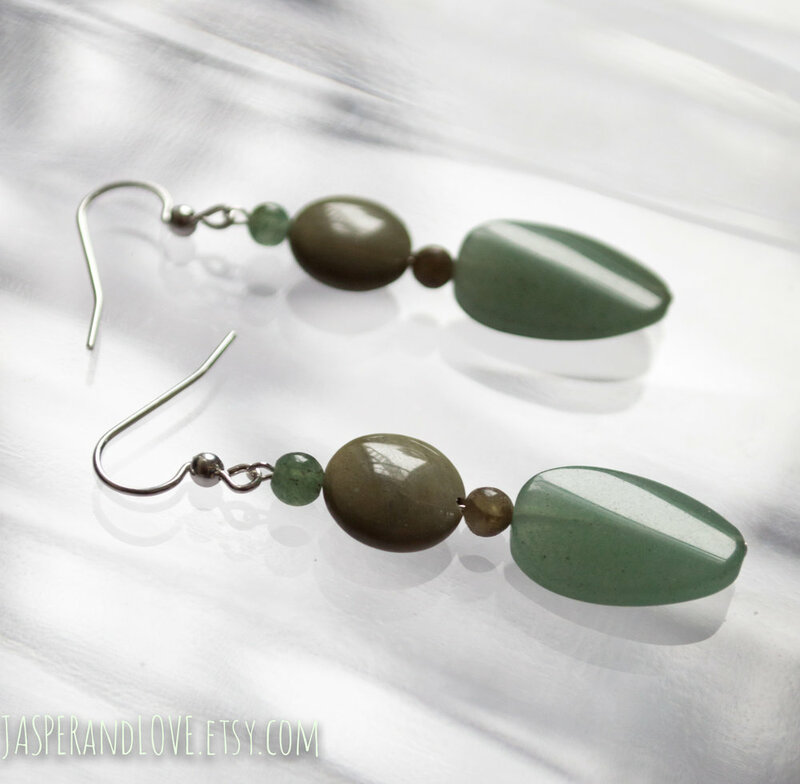 These lovely asymmetrical earrings are jasper from head to toe - three different kinds. 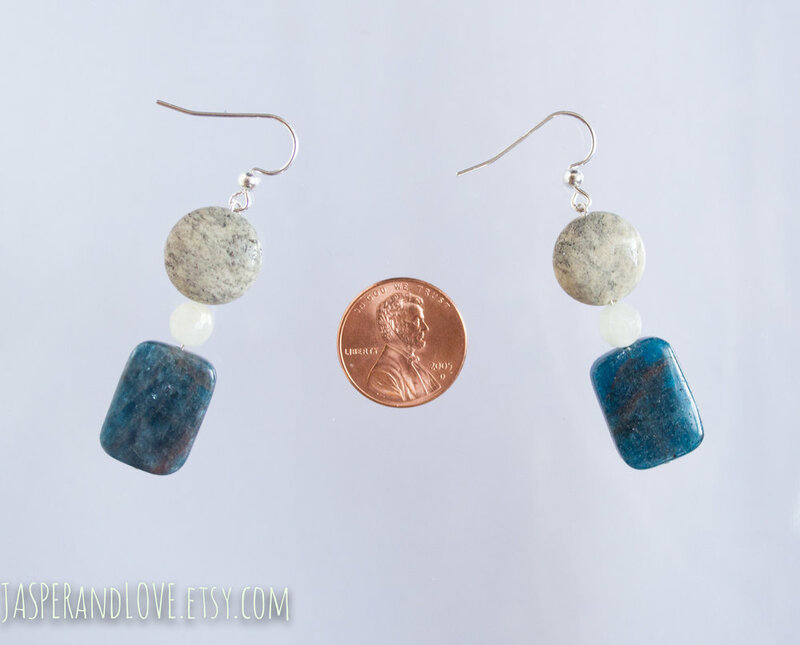 My very first lapis lazuli earrings! 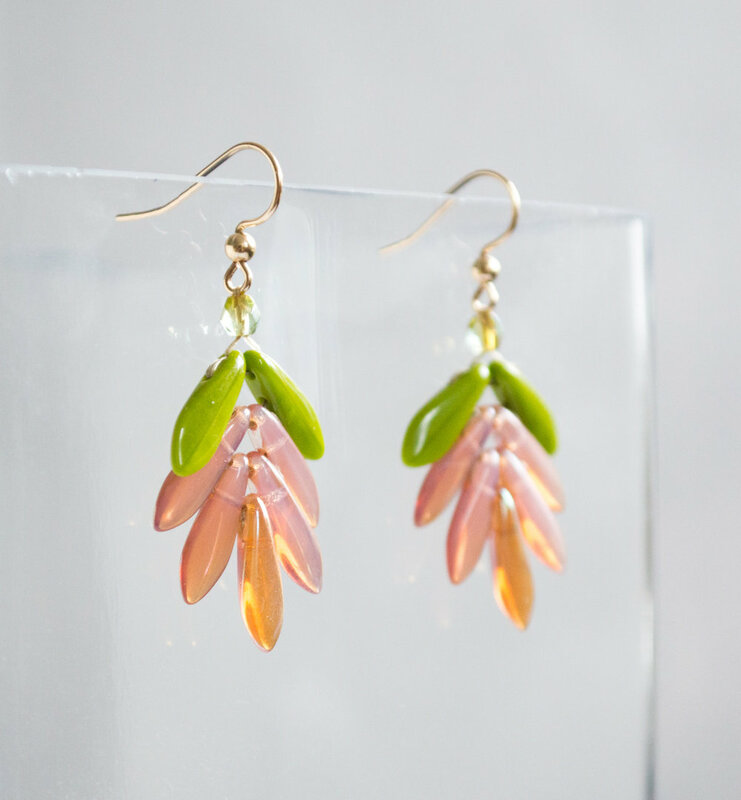 They seem like going-out earrings, but actually pair well with laidback sweatshirt weekends, too. Never bored of playing with this shape. You'll have to let me know if the concept is coming through on these. Do you see a flower at all? Is it working? 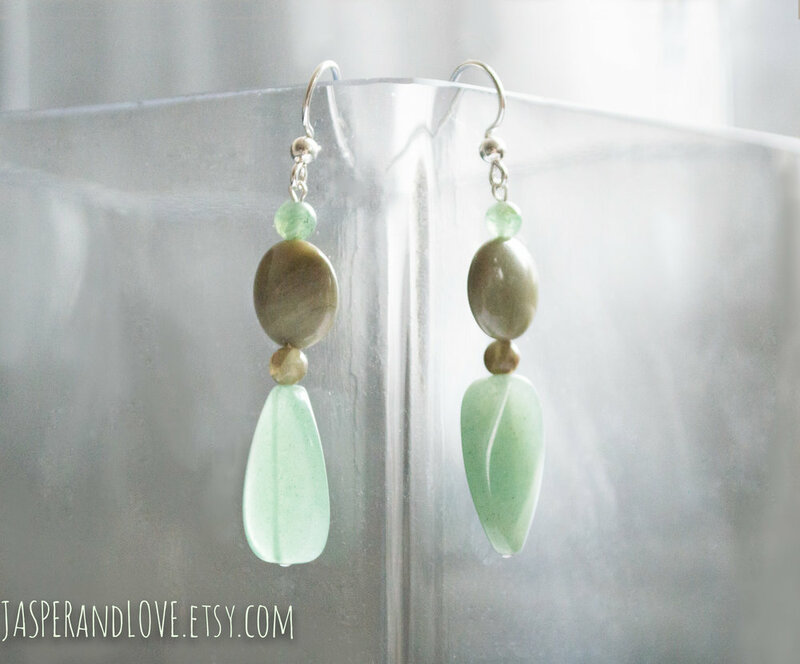 This is what's next - glass and 100% semi-precious stones :) For now, I'm including glass shots in each shoot, but I want to get to 80% glass for all listings. 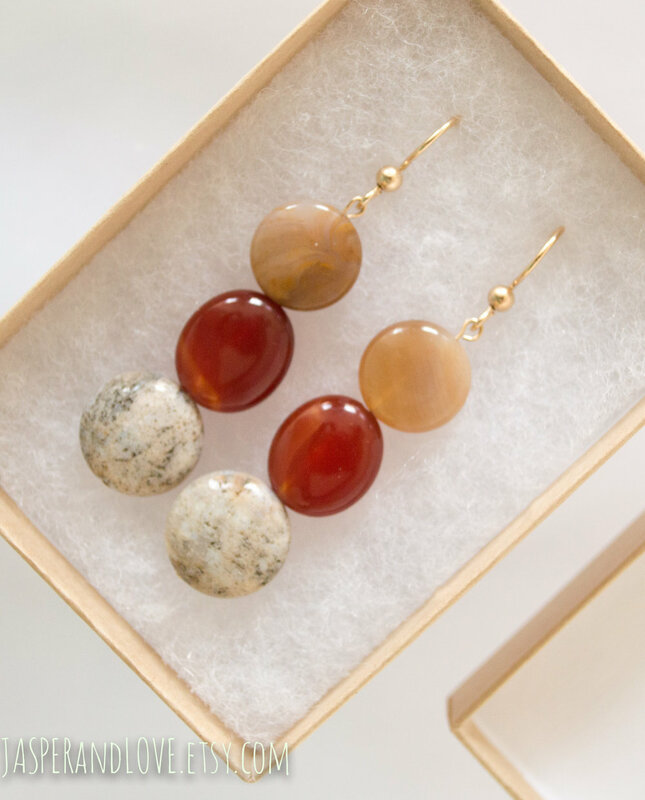 Most of my work is both semi-precious stone and glass bead, but these are both complete semi-precious stones and gold. Love the texture that brings, and uniformity of sheen.